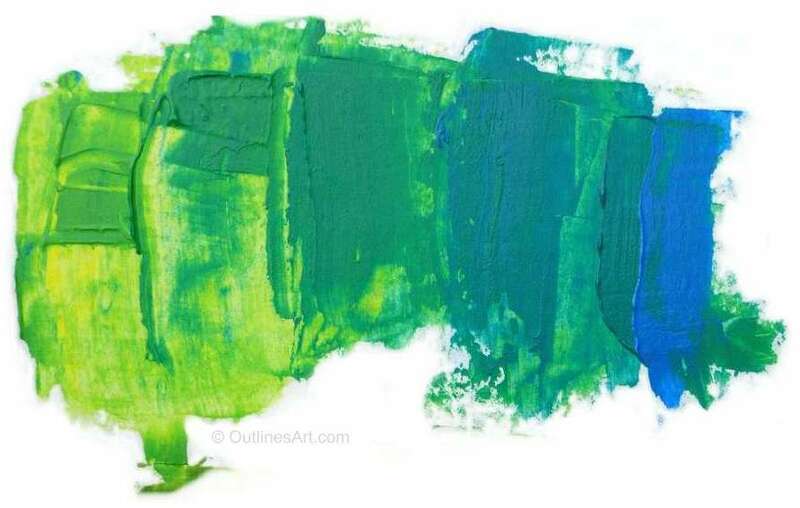 Green is a wonderful colour and has a whole range of of tones and shades but you can easily spoil a painting by reaching for the green in your paint set. In this tutorial we’ll show how to make a range of greens using combinations that give very different results. You will learn to make natural greens for landscape painting, soft colours for still life, abstract paintings and other subjects that call for non-standard colours. When you think of green, what immediately comes to mind? Do you see a flat bright generic green or do you see something that you think of as green, such as fields or trees? Landscape is a favorite painter’s subject where green is subtle. Usually, only a small portion is bright green and even when there are swathes of green countryside, it’s unlikely to be just like the colour in your tube of paint. It’s true that a ready made colour can be useful when you have large areas or man-made objects you want to paint. It’s very appealing and can be used in patterns and abstract works to good effect. 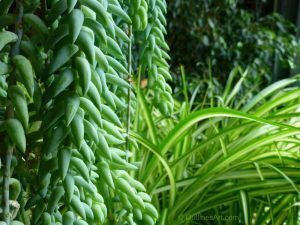 Ready-made Greens can be useful for mixing other colours too, we’re not suggesting you should chuck them out! To try the mixes you will need paint and a pallette knife and something to wipe such as kitchen roll or rag. You can use brushes if you prefer in which case you will need water to rinse as well. 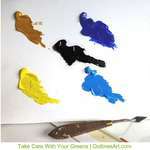 Use a flat pallette and several pieces of card will be fine to paint on, or you can use a canvas. I prefer to have a white or near white background for projects such as this. 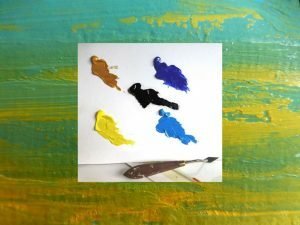 We are using Acrylic paints but the colour mixes can be done in other types of paint too, though they might use a different mixing technique. 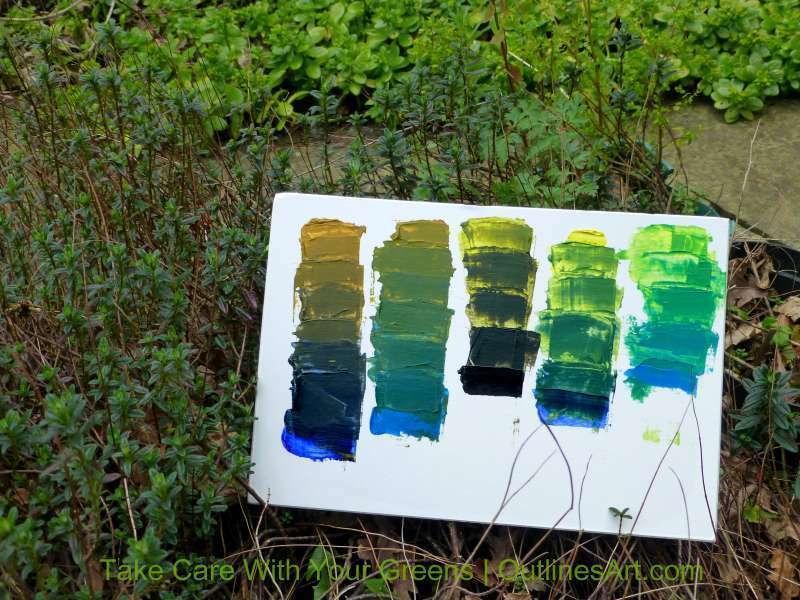 This does give a good idea of how to mix green in oil paint but mixing these in watercolour will need a grasp of basic watercolour techniques too. NOTES: I like to leave an area of the first pure colour at the top of each mix and finish with a pure bit of the second colour at the bottom. You will need to begin with a good amount of yellow to see the full potential of these mixes but start with a simple four or five stage mix for each combination. 1. For the first mix, squeeze Lemon Yellow and Cerulean Blue keeping them well apart. Spread a generous blob of lemon yellow and add a tiny dot of the blue. Mix well and spread the mix a short way down the board to make the next mix. Take a larger dot of blue and mix into your extra spread. Continue spreading and adding more blue, finishing with pure cerulean. This will show the progressive change in the colour. 2. For the second mix we’ll use Lemon Yellow and Ultramarine blue. Start again with yellow, a generous amount will allow you to add the ultramarine progressively as before. Take a tiny amount of blue and mix well. Leave part of the resulting colour in place dragging the bulk of the mix downward. Add more blue and mix well. Keep on dragging down most of each mix, then adding more blue. Do this as many times as you can to see the resulting greens. Finish up with the the pure ultramarine. 3. The third mix shows how Lamp black added to lemon yellow produces amazing greens. Starting with yellow and using the same method as the previous mixes, add varying quantities of black. You will see that small differences in the amount of black can make a big difference to the colour you make. 4. 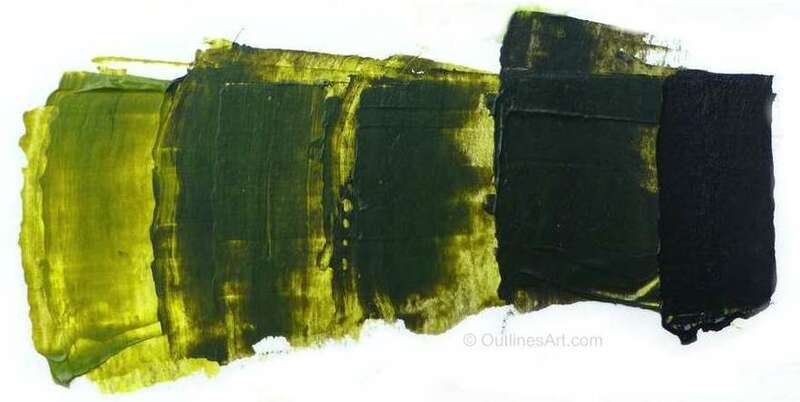 Mix number four demonstrates the subtle but dense greens that can be made with Yellow Ochre and Cerulean Blue. Yellow ochre is denser, less transparent, than lemon yellow and leans more towards red. Following the same procedure as before will show you the potential of this combination of yellow and blue. 5. Finally the fifth mix using Yellow Ochre and Ultramarine Blue gives us soft brownish and olive greens, strong khakis and deep dark bluish greens. As usual, start with the paler colour, yellow ochre. Mixing and spreading as you go, keep adding more blue until the final area of pure blue. Both are warm colours in this combination, each leaning towards red. It is the red element that creates the brownish hues. This is by no means all you can do; experimenting with small amounts of other colours or adding white will be an eye-opener so do make your own mixes. Look at the Chart you have made! You can see how wide the range of greens you have without even touching the greens in your set. From bright spring colours, full blown summer greens and dark forest shadows through to late hazy days and autumnal hues you can cover all the seasons. If you are painting people, you have shades that can be used for skin tones and that will be useful for clothes, such as army uniforms. When painting Buildings too, you will be able to use some of these shades as reflected colour or areas in deep shadow. Reminders: Notice the colours and make a mental note of where you might use them or you might like to write your ideas on the cards. Portability: If weight is a concern for your mobile kit you can take fewer colours with you. Keep reading for Final tips on this project, some suggestions and to download your pdf. Conclusion and how to use what you have learned. 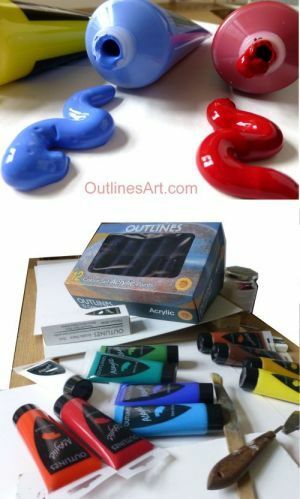 Having done the exercise you will have a better idea about which colours to use in sketches and paintings, even when mixing with a brush on the painting or making layers. When painting green areas you can use several greens in your strokes next to, and on top of one another with gaps revealing the colours below. When seen from afar it will have an overall colour just as it does in nature. In general it is best to add darker colours to light when mixing because less dark is needed to make a big difference and you could end up needing to add much more light to get the colour you want, resulting in more mixed paint than you need. This is particularly true for acrylics as they could dry out before you can use it all. The addition of white to your mixes will expand their uses even more. All the mixes can be used in Landscapes but are not limited to them. Later posts will give you more ideas – Don’t forget to check out the ‘Inspiration’ Section! You can share the quick reference image below to your social accounts and take a pdf sheet that can be downloaded and shared with your friends – Click here to get it now. Did you enjoy this post? Scroll on Down and let us know in the comments box – we’d love to know how it helped. mint green, teal, shallow water, beach scenes. forest green, dark green, mountain scenes, outdoor sports. olive green, soft landscapes, decor and food, military scenes and vehicles. Want to know about more articles like this? Sign up below for more tips, information on new products & the latest promotions delivered straight to your inbox. Newsletters are occasional – and we won’t share your email.